The PSP Go is getting off to a demo-filled start in Japan this weekend with a bunch of new demos and games lined up for launch. Guess which one's got me jealous of Japan? 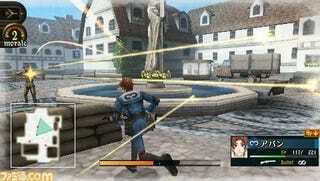 Famitsu's report that a Valkyria Chronicles 2 demo will drop November 2, the day after the PSP Go hits Japanese shelves. Also — and way less important to me — Phantasy Star Portable 2 will have a demo up on launch day itself. Not bad, Sega, not bad at all.